Smart deals in Costa Rica! The real estate market is slowly starting to move again. Tourism numbers are up and visitors continue to fall in love with this great country. We’ve been looking at many listings over the past few months and have found some great value in this market. From small surfer-perfect houses to beachfront condos and luxury properties, now is a good time to start comparing prices. Great deals are out there. Contact Tina for more information on new listings. Minutes away from world-famous surf at Playa Hermosa. 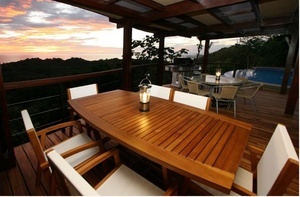 Luxury ocean view property in Manuel Antonio with options for future expansion. $1.265 million. Click for more photos and more listings. Great value in small community near Jaco / Hermosa. We’ve started a Facebook page. Make sure you “LIKE” us and keep up to date with hot new real estate deals, whale spottings, turtle rescues and happenings along the Pacific Coast. We’ve got some great photo albums posted already. More information on life in Costa Rica will be posted weekly. Turtle season is coming to an end on the Central Pacific Coast, but we have been lucky enough this season to witness a mother laying her eggs and recently hatched babies making their way to the ocean. If you don’t live here or don’t get down to the beach often, then I recommend a visit to the turtle refuge at Playa Hermosa. There you can help find nests and release the newborns! Vida Asana in Playa Hermosa is hosting an Anusara Yoga Retreat from Feb 3-10. The retreats are always popular so if you’re interested contact Vida Asana now, or email Tina for more information. After 5 years in the country, we’ve seen some pretty amazing places and are happy to make recommendations. In addition, we always encourage newbies to Costa Rica to spend several weeks or months in a place before they buy. This is a great way to test the waters and explore the pros and cons of a place – especially for those considering full-time living here. Feel free to contact us for vacation rentals, touring needs or long-term rentals. We have the experience and connections to help you out.